Yesterday I had the great pleasure of spending several hours on Skomer Island just off the Pembrokeshire coast. After a weather aborted attempt on Sunday the rain that greeted us on waking did not look promising but the day very quickly turned into an absolute scorcher, with wildlife to match. Almost the very first bird that we saw after landing on the island was a Short Eared Owl hunting along the northern valley before it dropped out of sight beneath the horizon. A bit of repositioning soon gave us superb if distant views of the owl sat atop a hillock devouring a small mammal (presumably a vole) that it had grasped tightly in its talons. We saw it flying several more times during the day but it always seemed to return to the same spot. I wonder if a nest is nearby? 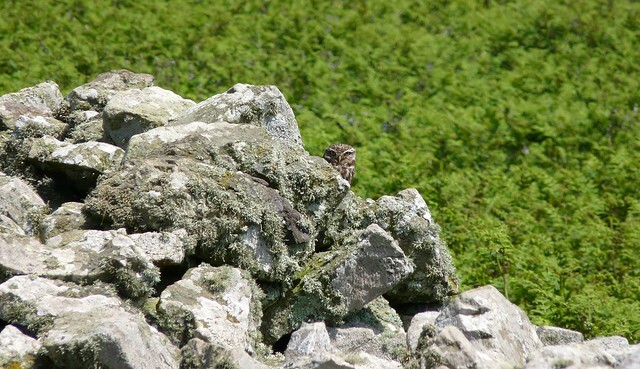 I remember being surprised that owls could be found on Skomer when I visited for the first time a couple of years ago, so you can imagine my amazement to find out that there were in fact two species that call this rock home. That second species is the Little Owl of which we saw one individual last time but at great range and very well camouflaged amongst the Bracken. This time around we received some excellent directions off one of the very helpful wardens as to where we were most likely to get some decent views, and boy was he spot on the money. 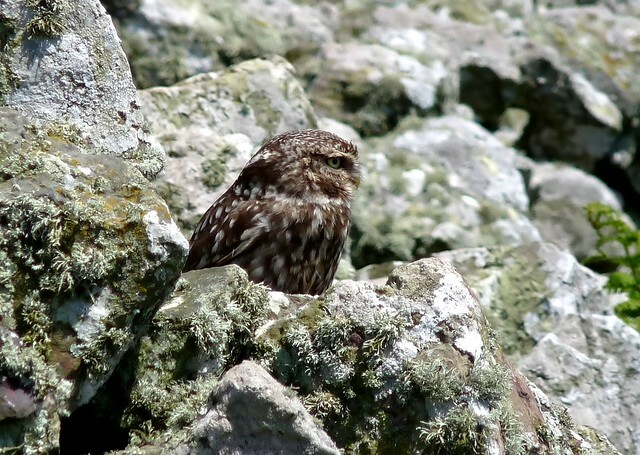 When we had first approached the wall the Little Owl looked like nothing more than a rounded rock sticking out against the skyline. It was only as we looked more closely that we realised this was much much more than that. Amazingly we were able to approach within ten meters or so with the owl barely giving us a second look, its attention far more focused on the passing Gulls and Corvids. Presumably it knew that we couldn't pass the no public access barrier and therefore posed no greater threat than the sound of the motor-drive on my dad's SLR camera kicking into action. The views we had were simply spectacular and have to rank up there as wildlife moment of the year so far. Here are a selection of my favourite shots. 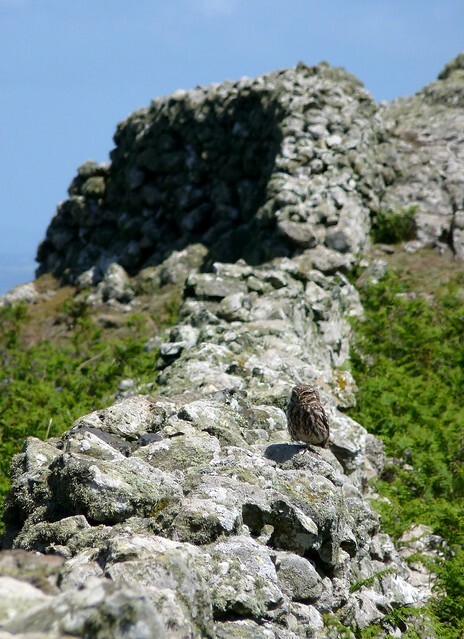 Of course owls aren't the main reason that people visit Skomer. 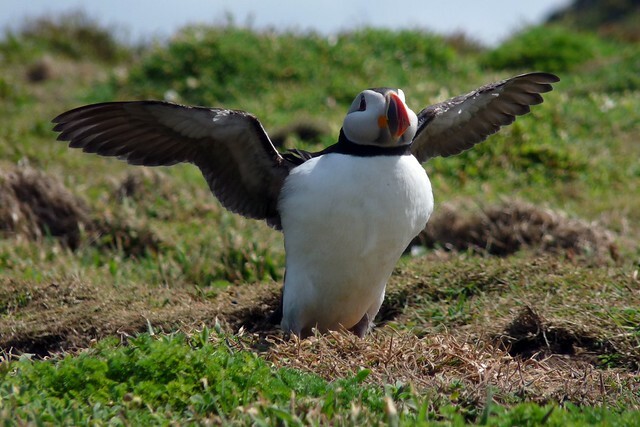 That honour goes to the enigmatic Puffins that nest on the island in their thousands. The best place to see them is in the area around the Wick, although their numbers seemed lower than when we last visited. I think this was probably due to a combination of many birds being underground on eggs whilst the rest were out at sea fishing having probably been grounded the day before due to the poor weather. Whatever the reasons there were still more than enough to put on an excellent show, and it was also nice to finally catch one with fish in its mouth. Although we saw several birds with fully laden beaks they often landed almost directly in their burrows to prevent their catch being pilfered by the always opportunistic gulls. Probably a wise move. 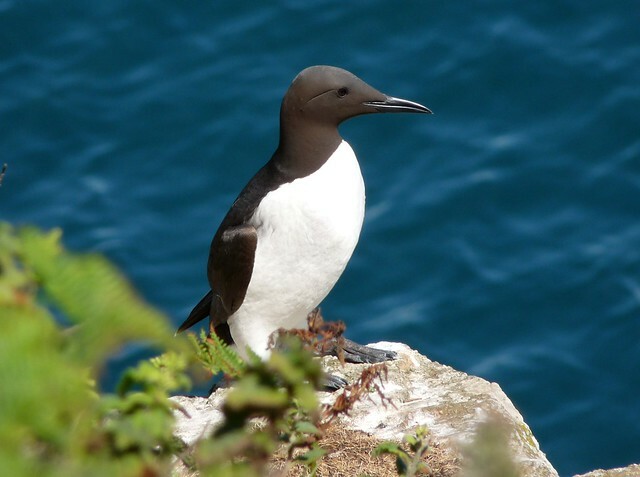 While waiting for the boat to take us back to the mainland I had the opportunity to photograph Razorbills and Guillemots. Ironically the steps up from the jetty offer the best place on the island to get close to these two species, as the massive colonies elsewhere on the island are all too distant. A few Puffins also nest in this area and there are often a couple of Seals either hauled out on the nearby shingle beach or bobbing around in the water. Other birds seen during our trip included Chough, Whitethroat, Reed Bunting, Sedge Warbler, Raven, Stonechat, Wheatear, Fulmar, Kittiwake, Shag, Cormorant, Gannet, Skylark, Swallow, House Martin, Meadow Pipit and many more. It really is an exceptional place to visit and I hope to return before the breeding season is done. Cracking shots. I'm particularly jealous of your owl encounters, as I've been there about 14 times, and never seen an owl of any kind! Wonderful images, I would have been like a kid in a candy store to see these beautiful birds. Top notch pictures of a glorious trip. Your stalking skills are remarkable especially with the two of you on the hike. 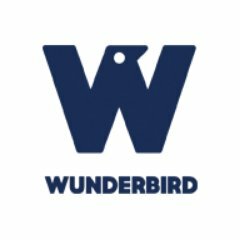 These are beautiful birds to focus your lens on, real show stoppers. Puffins and owls on the same day. Perfect post Adam, great story too with you and Dad starring! Superb shots Adam; every one of them. 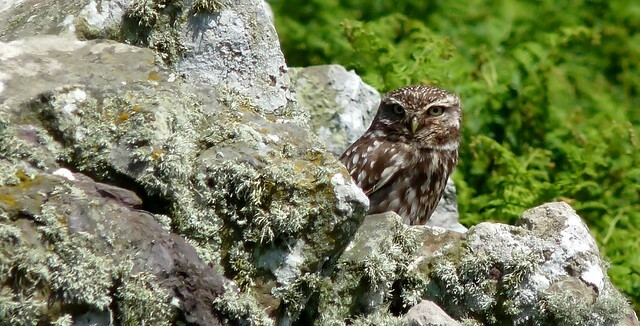 And what a confiding Little Owl. A great moment. 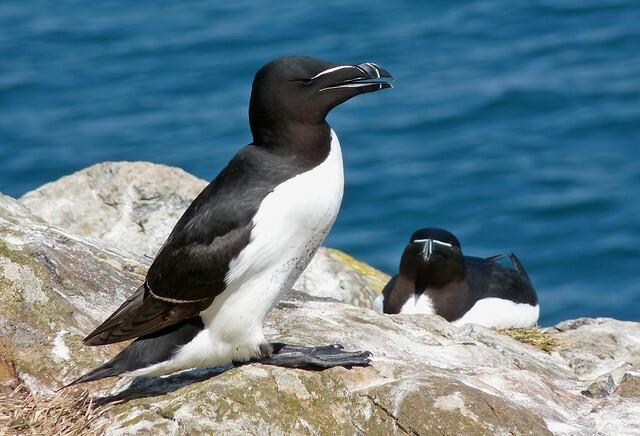 Beautiful owls and the Razorbills are stunning! Great photos!! Spectacular views of the owl! I would love to see some of the northern shorebirds - so far have only read about them. Hi there - what a great collection of images. 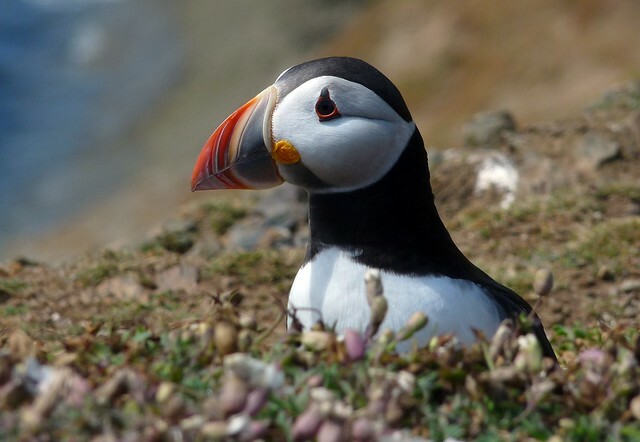 Puffins are such star birds - very good pictures. A really nice collection! Love the puffin, they are so cool! Thanks Jeremy. If you want detailed directions to where the Little Owl is hanging out then let me know. Thanks texwsgirl. It's hard to beat an Owl showing well! We really were spoiled for choice Martha. I'll probably put up another post this week with some of the other photos that I took on the island. Thanks for the kind words Springman. Don't think my dad could believe his luck with the encounters that we had. Thanks Keith. I've never known a bird to be so relaxed with humans in such close proximity. Thanks Fjallripan, Mick, Stewart and Oyvind. Amazing post, Adam. Were these all taken on a Lumix (mine is the 18 zoom)? Really superb. Puffins are definitely my favourite bird ... though we enjoyed hearing about Emperor Penguins from Jim Perrin at Hay yesterday. They certainly were Caroline. I've got the Lumix FZ28 so 18x zoom as well. Wow, brilliant pictures that you've taken, I love the Razorbills and the Owl, not to mention the Puffin. 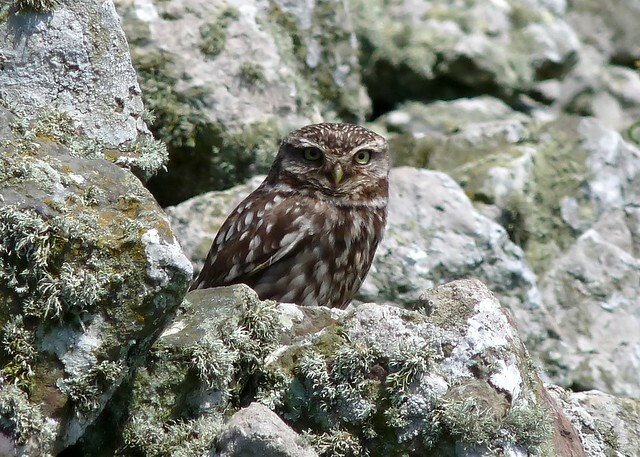 A great set of images Adam I love the Little Owl captures...very well taken. 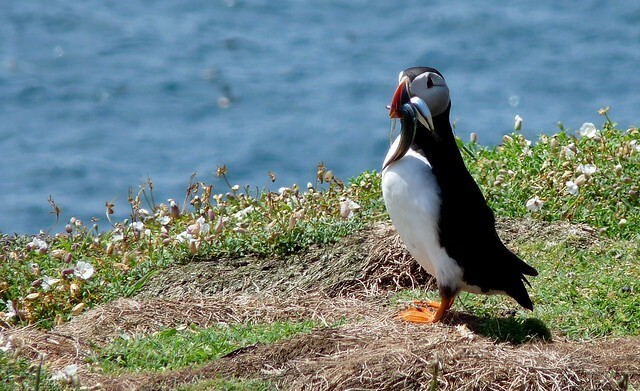 I could watch Puffins all day. OH MY goodness---Those are stunning images!!! Wonderful photography, Adam! These shots are spectacular. Yellowhammers on camera at last!